As you can tell i've recently been very inspired by the welcoming of the sunny spring weather, as i've been putting together a lot of content focused on spring and transitioning into spring beauty wise. 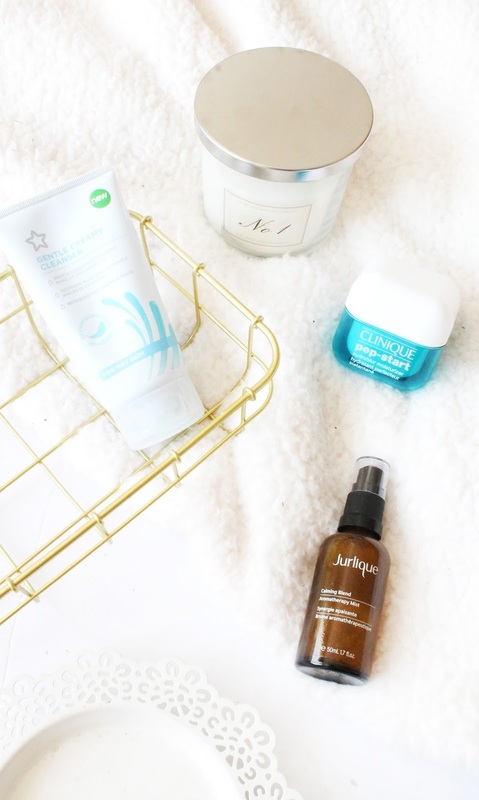 I thought today i'd share a few skincare picks that i've been loving recently, and will be carrying into the spring/summer months. When it comes to spring time, skin wise I find that my skin isn't as dry as it typically is during the winter but it still definitely needs a bit of TLC from time to time to combat any dryness, and to also give it a bit of a radiance boost. In prep for travelling to Australia I was on the hunt for a simple and cheap cream cleanser that I could take, and not care if I were to lose it or accidentally leave it in a hostel, but luckily I didn't and in turn found a cleanser that I actually really like. The cleanser in question is the Superdrug Cream Cleanser for Dry & Sensitive Skin (£3.49), which is like any other cream cleanser that i've used but I find it's amazing at removing any type of makeup, even waterproof, whilst also helping to remove any dry skin that I may have lingering. I also like that it is very gentle on the skin, and also calms down any redness or sensitive areas that have come up. For the price it's definitely one i'd recommend trying, as it doesn't break the bank what so ever. A moisturiser that i've featured a fair few times now, and i'm still loving is the Clinique Pep Start Moisturiser (£24.50) which is a lovely day moisturiser that is lightweight, but gives just the right amount of hydration that my skin needs. It sinks into the skin within seconds, meaning I can still use it in the morning when i'm in a rush. I also find it helps to blur any unevenness and sort of acts like a primer as such as i've noticed that my foundation doesn't tend to dry into my face as much as it used to. I purchased this back around Christmas time, and have used it pretty much everyday since, and i've barely used any so it's definitely one that goes very far, and justifies a slightly more pricey price tag. Finally for this round up i've been trying a few products from Jurlique recently, as they sent me a few products to try in time for my little Australian adventure. One product i've been loving is their Calming Blend Aromatherapy Mist* (£17), which at first I thought was just for the face but this can actually be used on the body and also around the home as it is a calming mist that calms your senses, and not just your skin. I find giving a spritz of this once or twice a week, especially when i'm feeling a bit stressed or tired, it really help to relax me and i've found it also relaxes my skin also. If you're one for wellbeing mists, then i'd definitely recommend checking out their selection of mists, and they have a few in their range all designed to promote different things.